Denim-on-denim may not be an entirely new fashion concept (Canadian tuxedos, anyone? ), but this season, all-denim looks have been given a serious refresh (read all about it here). Colorful denim sets are popping up just about everywhere, giving a new life (and meaning) to the classic trend. But that's not to say the tried-and-true head-to-toe blue-jean outfits are going away anytime soon. 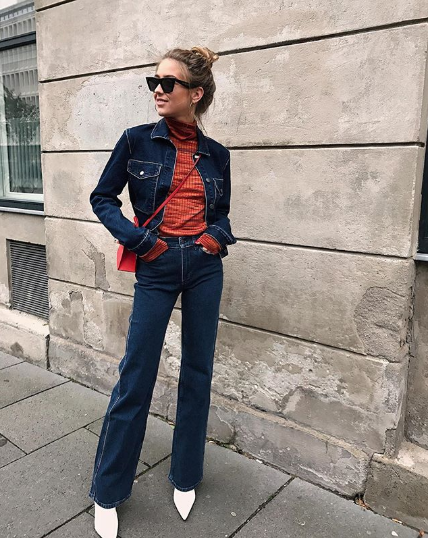 Which is why we decided to turn to Instagram to see how some of our favorite fashion girls are wearing denim-on-denim right now, and we found so many cool, fresh takes. Ready? Behold your ultimate how-to guide to rocking the Canadian tuxedo the 2018 way. Ground a dark denim look with a pair of crisp white booties. A button-down paired with denim-on-denim makes for a refined-meets-cool ensemble you can wear all day long. Switch it up by wearing the shirt over the jacket—and not the other way around. Try the color denim trend that's taking over rapidly. Try out an upgraded denim jacket design—a belted or corseted style, for example. Everyone needs a cute jean skirt. A denim trench is a must-have for fall. Stick with a simple tee underneath an oversize denim jacket. Throw a trench coat over your denim-on-denim base. On a warmer fall day, try a cool denim jacket styled with a pair of jean capris. Mix and match two different shades of denim. Dark denim is a must-have for fall. Pair an oversize denim jacket with a sparkly top for an unexpected but super-cool mix. Want more denim outfit ideas? Read on to see the coolest ways to wear your jeans this fall.